Source: Ewald Flügel, “Liedersammlungen des XVI. Jahrhunderts, besonders aus der zeit Heinrichs VIII. III; 6. Die lieder des Balliol Ms. 354,” p. 194, in Anglia. Zeitschrift Für Englishche Philologie, Vol. 26 (Halle: Max Niemeyer, 1903). that I shuld let slyppe & say: go bette! we shall haue game & sport ynow. with yer he goth, yer he goth, yer he gothe, how! with trororo [ trororo ! trororo, trow! The word “explicit” occurs in the text both immediately before and immediately after the carol. The character "|" operates as a full stop, like a period. I met with a forster yat badde me abyde. with hey go bet / hey go bet / hey go howe! I badde, let slyppe / and sayd: hey go bet! with hey go bet / hey go bet howe! There he gothe / there he gothe [hey go howe] ! With tro / ro / ro / ro : tro / ro / ro / ro ! With hey go bet / hey go bet [hey go howe] ! There he gothe j there he goth [hey go howe]! We shall haue sport and game ynowe! 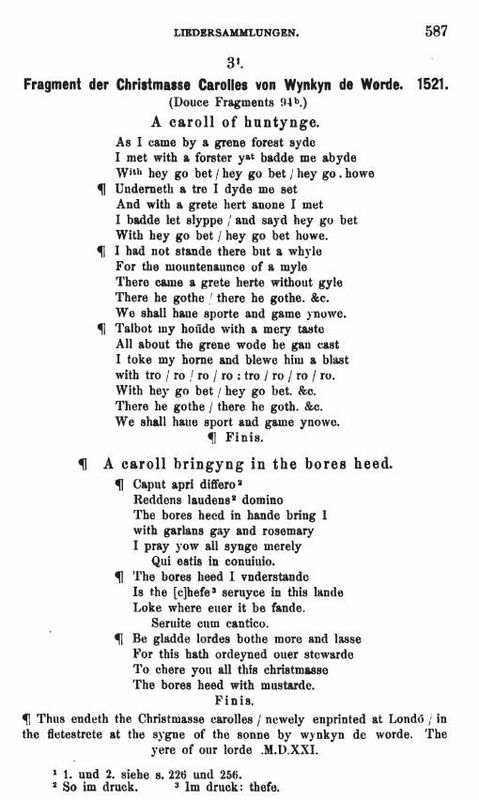 Flügel also printed the text of “A Carol Bringyng In The Bores Heed,” The bores heed in hande bring I, from Wynkyn de Worde. See generally Notes On The Boar's Head Carols.